Zerv2 knows absolutely nothing about the C8. Anyone who falls for his antics is just gullible. He loves to post ridiculous stuff to get folks talking. Cracks me up. The only apology that would be due is if there is NO C8 in the $65k to $80k range. Nobody, and I do mean nobody, missed the fact that the claim was for 1 price only, $169k. It it was not until the Troll was called out on it (so very long after the first post/claim) that said Troll (you know, the one whose sources are ‘rarely wrong’), tried to backtrack on that (the possibility of a base priced C8). Zerv just put it on the line, so...I'm pretty sure he is all in. I hope the apologizers are lining up and ready if this happens. That list is LOOOOOOOONG. Last edited by tcinla; 01-04-2019 at 09:05 PM. I suspect that Zerv02 is a Russian Troll and he has nothing to do without elections on the horizon. His $169 K prediction was total fiction. I also suspect he doesn't own a Corvette...……. 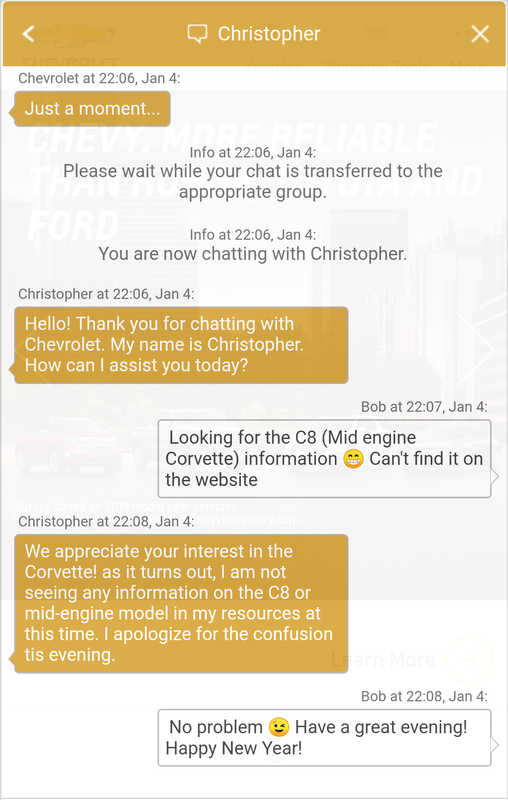 Zerv02- get on the Ford websites and leave the good Corvette people alone. What does a Ford have to do with a Corvette???? I hope the apologizers are lining up and ready if this happens. That list is LOOOOOOOONG. Don't count on it...apologizing is so not 2019.
the only Ray of light is the writer doesn’t believe this any more than any other competent person would. My thoughts on when and how the C8 will be revealed. I think at the NY Auto Show, where the First 1953 Corvette was shown. How about a C8 alongside a 1953 Corvette at the NY show, and let GM show off just how great this American sports car is. When ever it is in the showrooms, I'll be there to check it out, and hopefully order one at that time. Last edited by steve0415; 01-04-2019 at 11:21 PM. We “should “ be officially told it’s coming in Detroit . KKC7, LOL! Nice try . Thanks for trying! works for the NY times...why not car news sites? Uh, hate to break it to you but the Times is one of the most award winning papers out there - for fact finding and research. Don't let the lefty editorial page get to you - that is where opinion belongs, not as a lead-in story as that other organization thrives on. Regrading the ME, I don't buy the electrical issue as a delay. Higher voltage or not, this type of electrical design is pretty straight-forward. That is a fake smoke screen in my opinion. I hope the reveal is in Detroit. We shall see. I think those who care - people like us - are getting a bit tired of the stretched out release. Get it out there GM and please don't let this product get ruined by the beancounters. GM history is littered with great engineering and designs only to have them ruined by the financial side. And to add insult to injury, GM winds up spending the money in the end to make it right. By that time the reputation of the product has been ruined. So GM try it the right way - correct out of the box! Last edited by golden2husky; 01-05-2019 at 10:30 AM. Looks like the 60kers are going to have to look really stupid in a few days.. we shall see. Well if the car does start with a base price in the 60's ...you are going to really look stupid! I think the "60kers" have got it right for a base 1LT Coupe! Last edited by Supersonic 427; 01-05-2019 at 01:04 PM. Thanks for linking that up. I was on the go and couldn't post the link to the mystery announcement. So far, what has Zerv02 proven to be correct about? There is a "Pending Industry Announcement" scheduled for January 15, at 8:30 am for an hour. Scheduled for the Atrium Stage. Now, I've never been to this show and have no idea to what this can be referring to but it does sound rather generic on a list of itemized events.